It’s been pretty quiet In My Kitchen for a little while. Aside from time away discovering Vietnam and Cambodia, the pace of life seems to have stepped up a notch. Since returning home from my trip, meal prep has been done in the most expeditious manner possible as I endeavour to find some sense of normality. Is life ever the same after time in a new country? In My Kitchen I have a new Cambodian Cookbook. 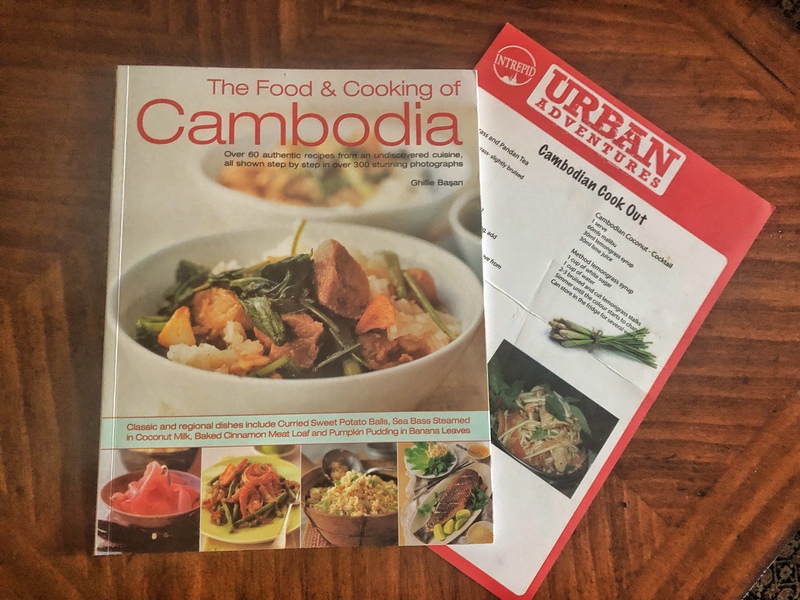 Not much has been written about Cambodian Cooking and I was keen to find a book of recipes that were uniquely Cambodian. Not sure how well I have done choosing “The Food and Cooking of Cambodia” by Ghillie Basan, but will report back in the fullness of time. If all else fails I do have the recipe handout from the Cooking Class we did at Urban Ventures in Siem Reap. In My Kitchen I have Kampot Pepper from the source, Sothy’s Pepper Farm in Kampot Cambodia. Kampot Pepper is a uniquely Cambodian product thanks, in wine speaking terms, to terroir. The nutrients in rich red clay soils of Kampot give the pepper berries an spicy heady fragrance and flavour with a punchy pepper flavour that’s much more assertive than the average peppercorn. I brought home green and black peppercorns, the black to be crushed and green, which are preserved in salt to add whole to sauces. The Cambodians make a dipping sauce of lime juice, fish sauce and a lot of ground Kampot pepper, delicious for drizzling over grilled chicken. In My Kitchen I have coconut juice caramel. We took a tour to the Mekong Delta while in Vietnam and there visited lots of cottage industries including a coconut processor. Sweetened coconut water is simply boiled until it caramelises into toffee. Once cooled it’s hand stretched, cut, folded into a piece of rice paper then wrapped. Some toffee is left plain, and others have ginger, peanuts, cocoa or coffee added. It’s chewy but very delicious. 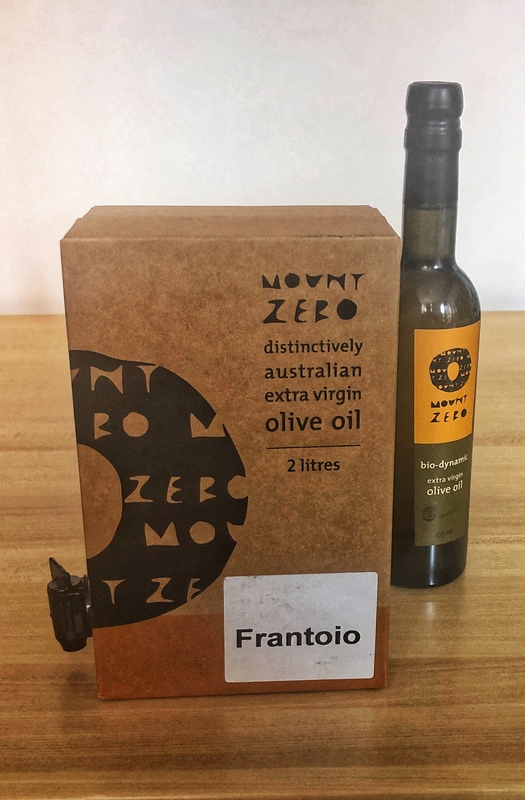 And on an entirely different note, In My Kitchen I have just received a shipment of olives and olive oil from Mount Zero in Victoria. I have tried very hard to accept that the olives and oil available locally here in Queensland are just different but, in the end, I decided to swallow up the food miles and buy a stock from my reliable source in Victoria. Now I am in olive heaven. The single variety oil is sensational, much too good for cooking so we will be enjoying beautiful salad dressings this summer. The biodynamic oil is super buttery, so I’ll use it sparingly for extra special dishes. As for the olives mmmmm. I love them gently warmed. And to finish things off I wanted to show you the oldest still used tools in my kitchen. 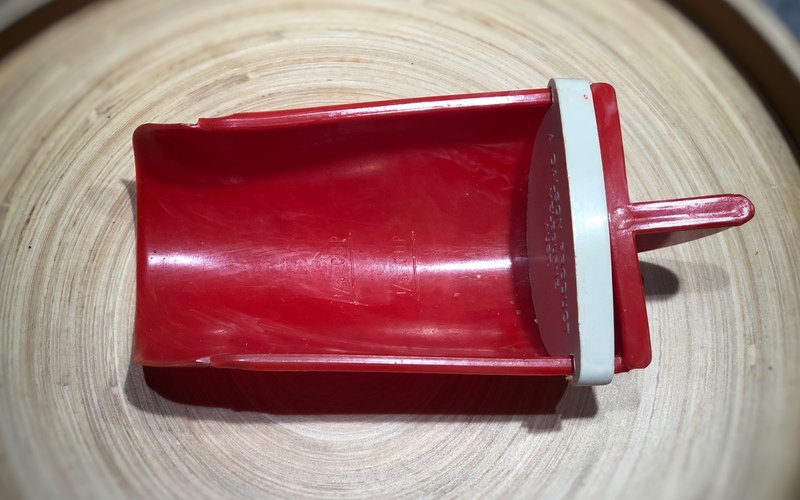 This plastic scoop C1955 was in a box of goodies my parents received from friends in the US one Christmas all those years ago. Plastic domestic products were still rare in Australia then. The scoop lived in my Mum’s flour canister and now it’s used every morning for scooping homemade muesli. It was accidentally washed in the dishwasher at some stage and that’s what has given it a unique shape. 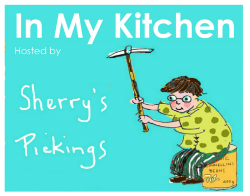 Thanks to the lovely Sherry from Sherry’s Pickings for hosting this monthly blogger forum. Now I need to think about Christmas……. I admit that I can take or leave pepper usually. However, having tasted the Cambodian variety I can see there’s more to it. There is a wonderful breadth of flavour running as undertones to the bite. There is a subtlety as well as spice. Am I getting all flowery? Anyway, I’m making sure I get my share. 🙂 Happy New Year to you and your family from us in Englishland. Oh, I’ve seen the news – stay cool. Sandra, what an adventure you’ve been on! No wonder life at home doesn’t feel “normal” yet. 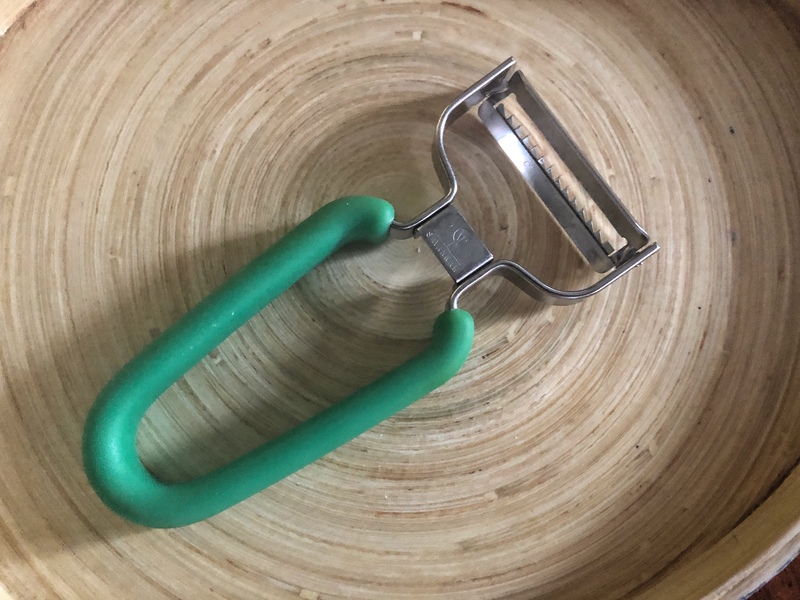 Glad you found that julienne peeler to bring a taste of your travels into your kitchen. Loved your suggestion to warm olives, too. (Now why didn’t I think of that?!) Wishing you a very Happy Holidays! I love that old scoop, but am not convinced of the julienne tool. My own julienne tool is useless, but it probably isn’t a good quality one. It is wonderful to travel and explore other cuisines and I can tell you’ve been inspired by your recent Cambodian adventures. The coconut caramel sounds interesting. I’m glad you got your olives and olive oil. I’ve never seen it in boxes with pouring spouts like wine, but it seems a very good idea as the interior bag simply deflates when you decant some oil and keeps the air which is what causes the oil to oxidise and become bitter. It’s been a disastrous year for olives here in Greece – weather and insects are to blame. Happy Christmas to you and the family! Dashed to Myer for a Savannah peeler and julienne tool. Nice and sharp. Think of you every December, Sandra, when I go to Books for Cooks for a gift voucher for my daughter in law. You are an influence for good :). Merry Christmas to you too, Sandra. Cambodian cooking would be a new one on me too. I must look into it. I have been on a bit of a Thai binge in recent times, an offshoot of a restaurant marketing and photography job I have been enjoying. Travel definitely changes what and how I cook, even how I approach the market. I have not heard of Savannah tools, that hand shredder looks much more convenient than dragging out the spirillizer. And I definitely have olive oil envy. Welcome home and happy holidays. Thanks Liz, long time no see. We both seem to have slowed our pace of blogging. As I process what I experienced I realise Cambodia made quite an impact on me. A Cambodian breakfast of fried rice is becoming my norm, just rice veg and a little fish sauce for seasoning. Sounds delicious to me, but I like avocado on toast with soy sauce for breakfast. Reproducing exotic flavors in a kitchen far from the food origins is really challenging, and I am impressed by your determination and your collection of authentic foods and spices. I just did a big search for brined green peppercorns — had to mail-order the Madagascar product. Yours look great. For me the recipes and food ideas I bring home from travels are the best souvenirs. The green Kampot peppercorns are fresh, straight from the vine, preserved in salt. They pack a mighty punch. I’ve never seen them available in Australia, even from our best spice purveyor. A pantry to be proud of. Your Kampot Pepper looks to be very interesting and the coconut juice caramel sounds fantastic. Now, about that scoop, Back in the ’50s and ’60s in the US we got all kinds of things in boxes of food. Glasses in oatmeal and toys in cereal even drinking glasses with jam in them. But I don’t remember a scoop, maybe it came with cereal. I’ll have to look into this. When I saw the scoop it invoked memories from my younger years. Then I remembered that it resembles the old Tupperware Rocker Scoop which we had for flour and sugar canisters as a youngster. Coconut juice caramel?? I MUST find that someday. Hi Fiona, I tried to comment on your post this am but the site wouldn’t recognize my URL. Was planning to try again later. Check out the new Kitchen Warehouse in FV, for a good shredder, I noticed they have a lot of Savannah tools. Each SE Asian country seems to influence the others but thankfully they still maintain some individualism. This is great. Kampot Pepper. Wow. What a trip! No, life is never the same after visiting a different country. And that’s why we travel! I love seeing what’s happening in your kitchen, especially the influences of your trip. The cookbook is a good way to continue the adventures, so I hope it is full of recipes that you want to make. Sandra, this is a great ‘teaching post’ from you with Fran’s’ help – thank you! Had never heard of Savannah products but shall check as soon as . . . My olive oil comes from nearby yours – woulds you believe the produce of a Melbourne lady I met on Facebook many years ago . . . golden green and wonderful: but it will be great to try yours! Been to ‘Savannah’ – would not have found without you . . . oops! how much can I pinch from my Yuletide buffet . . . my style for certain . . . I totally agree with you about looking for a new normal after traveling…especially some place where you have connected deeply with the food and culture. I discovered Savannah products a few years ago and agree, they are very good quality. I will look into the olives…thank you for the tip and for this post. Cambodia is a surprising destination. The people are gentle natured and very industrious, working hard to earn enough to educate their kids and lift themselves out of a life of subsistence. They’re acutely aware of the value of tourism, especially westerners $$ so our experiences were outstanding. A big bonus Ardys, the diet is simple and clean. I didn’t even have a bout of hiccoughs! So good to see you back on IMK again Sandra. I have been enjoying your travel posts too. I can’t go past Mt Zero olives either. I throw ordinary old pitted olives on my pizzas, but when it comes to table olives, Mt Zero are the best. That little tool looks really good: I have quite a few collected from markets in Vietnam and Thailand. They work well enough but are a bit flimsy. Thanks Francesca, I’ve bitten into so many horrible olives in Qld, I had to take matters into my own hands. The oil is divine too, almost good enough to drink! 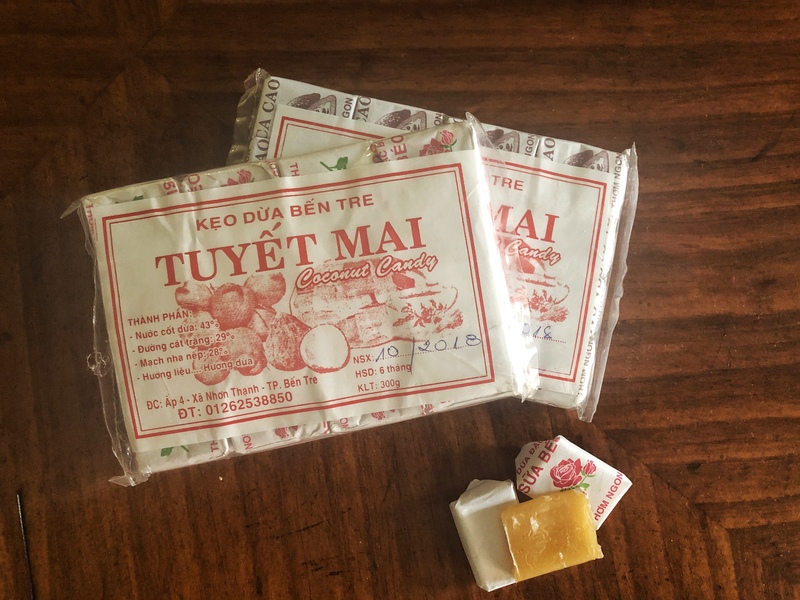 This entry was posted on December 6, 2018 by ladyredspecs in Cooking, Food, In My Kitchen and tagged IMK, in my kitchen, Monthly In My Kitchen, monthly roundup.